A few weeks back I enjoyed a delicious and wonderfully glamorous brunch at Measure Lounge in New York's Langham Place Hotel. There were seasonal mimosas with fresh rhubarb and celery juice, lobster mac 'n' cheese, 4 cheese grilled-cheese sandwiches, and an incredible blood orange kale salad made with pomegranate, walnuts, feta and a lime dressing. Perhaps my favorite of the whole meal was the Cold Brew Bottled Negroni, and luckily for all of us, I was able to track down the recipe. Pre bottle and store in the refrigerator. 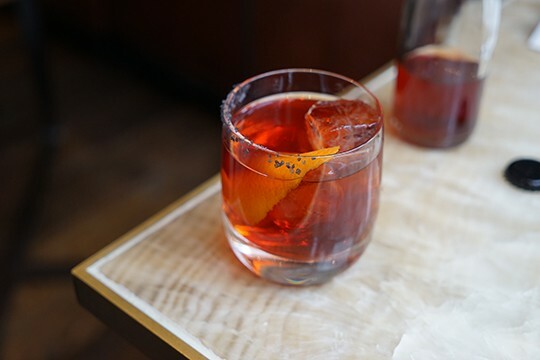 Pour over ice into a low-ball glass, garnish with half rim black lava salt and an orange twist.